Papa John's Pizza aired a new commercial during the AFC and NFC Championship games over weekend. In the new Papa John's Ad Papa John is joined by Peyton Manning and Jerome “The Bus” Bettis. The ad shooting took place in the Super Bowl Stadium in Indianapolis. The ad shows Peyton Manning (Super Bowl XLI Champion) in a referee outfit. Papa John's gives free pizza and a 2-liter Pepsi Max to Papa Rewards members, if America guesses the Super Bowl coin toss right: heads or tail. Visit freePapaJohns.com for details. The results will be announced on February 2. Papa John's is advertising around the Super Bowl 2012, but not in the game. Pepsi Max is running actual Super Bowl 2012 Ads. 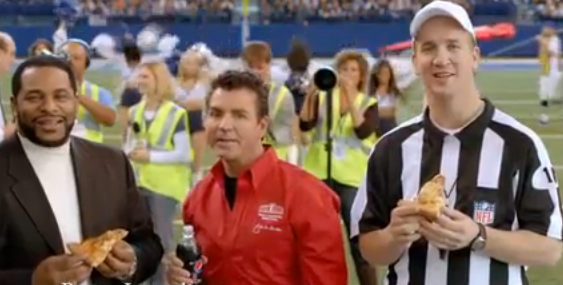 Watch the new Papa John's Super Bowl Coin Toss ad below.